Nielsen’s audience measurement system—the gold standard for pricing TV ads—faces the challenge of capturing all sources of viewing data due to audience fragmentation and increased video consumption on connected and second-screen devices. New products on the horizon from Nielsen and others aim to close this gap. Tracking viewing beyond live telecasts is evermore critical for TV networks looking to monetize ad inventory, and for marketers who need to communicate messages wherever their targets consume content. Meanwhile, Nielsen’s panel of TV homes is on overload, unable to effectively report on continually fragmenting live audiences or digital video watched on connected and second-screen devices. Emerging measurement offerings may draw on data from millions of homes, but all possess significant holes—including lack of geographic representation and measurement of the number and demographics of people in front of the TV. Nielsen’s Total Content Ratings (TCR) system seeks to measure and report TV program audiences regardless of where they are watching, including linear TV and connected and digital devices. Digital publishers will tag content with code in order to send data to Nielsen when people stream video, supplementing the home panel sample size and improving viewing estimate accuracy. Participation from digital video giants Facebook and Google will be critical, as the majority of digital video ad inventory is sold on these platforms. TCR will undergo at least a year of testing and observation before Nielsen releases Total Advertising Ratings (TAR). TCR challenges include the ability to measure video on myriad combinations of devices, operating systems, browsers and apps. Dealing with incremental costs and more closely aligning TV ad impressions with those on digital are also issues. 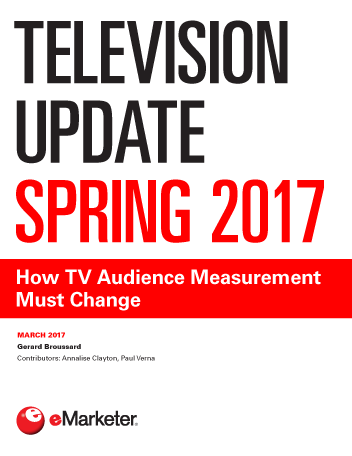 "Live TV viewing has declined dramatically, particularly among younger viewers. Between 2011 and 2016, the number of 18- to 34-year old and teen viewers declined an average of 6.2% and 8.2% per year, respectively."